Jessica has worked at IVH for 2 years now, previously starting up front as a receptionist and recently starting work as a Veterinary Assistant. 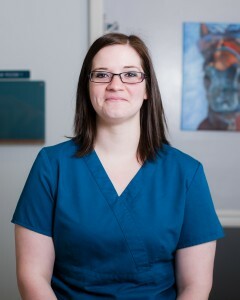 She initially wanted to come here after working in the veterinary field elsewhere for four years because she was a client at the time and she loved the doctors and has always been interested in animal health care. She really enjoys working with people and their pets as well as client education but her favorite things about IVH are the relationships we achieve with our clients and the people she works with. At home, she shares her house with 4 dogs: Subaru & Clipper, Irish Wolf Hounds, Babe, a lab mix and Mayzi, an Australian Shepard, as well as 5 ferrets: Archer, Boost, Zorro, Laurel and Zanda, and a new addition, Happy the cat. Outside of work she enjoys going to dog shows with Clipper, Hiking and being outdoors, and road trips. The above is a 24 hour telephone number for Animal Critical Care & Emergency Service who have two locations: Renton and Seattle. "We treat your pet as we would our own"